Move over, old tequila. New tequila wants its reputation back. It’s easy to see why most of us wouldn’t know a high-quality tequila if it hit us over our heads. For decades, this Mexican agave spirit has been marketed as the party spirit and, consequently, the cause of millions of headaches and tummy aches worldwide. But as appreciation for artisan spirits increases, consumer can choose from more high-quality tequilas. 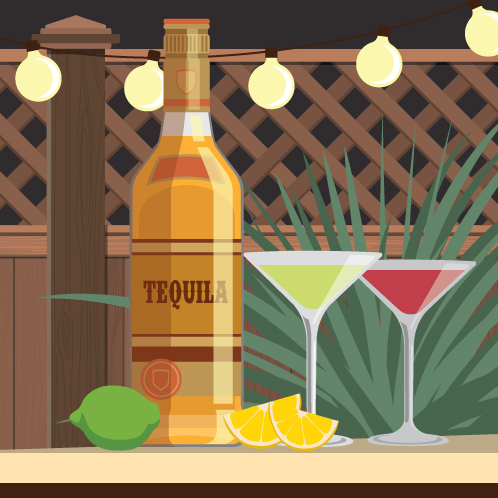 Tequila’s credibility is growing – super premium tequila sales are up over 500 percent since 2002 according to the Distilled Spirits Council of the United States. The Spanish began producing tequila – a spirit made from just one type of agave plant and different regions – in the mid-16th century after they ran out of their own brandy and needed a boozy pick-me-up. But anthropologists believe the indigenous people of Mexico were drinking tequila’s predecessor, pulque, or fermented agave, as early as 1400 B.C. The Aztecs loved it so much they offered up human sacrifices to ensure its eternal abundance! Tequila is a type of mezcal. Both tequila and mezcal are made from maguey, which is another name for the agave plant. But tequila is made only from the blue weber variety. This means its flavors are mostly due to the terroir and altitude of where the agave is grown rather than the species itself. All tequila must be made in the Mexican states of Jalisco (where the town of Tequila is), Nayarit, Michoacán, Tamaulipas, and Guanjuato. You might see a fine tequila menu organized by whether it’s from the highlands or lowlands of the region. Tequila made with blue agave grown in the highlands, like Don Julio or El Tesoro, tend to be larger, more floral, and sweeter, while those harvested in the lowlands, like Partida and Casa Noble, taste earthier and spicier. A tequila’s alcohol content, cellar conditions while aging, and type of barrel also define its flavors and aromas. Jimadores – the machete-wielding guys who harvest agave – skillfully remove hijuelos (agave offspring) without ruining the mother plant and cut away the leaves from the heavy piña. Then, producers bake the piñas (the agave plant's pineapple-like cores) in either traditional brick ovens or metal autoclaves, which are like pressure cookers, extract the juice, ferment it, and distill it. Sometimes tequila is aged. Tequila bottles do not come with worms – it’s not allowed! If a bottle has a worm in it, it’s mezcal, not tequila. In the old days, a worm’s preservation in the alcohol was proof to the purchaser that the liquor contained sufficient alcohol content, but now a worm in a bottle is nothing more than a marketing gimmick. Worms actually attack the agave plant and ruin its quality while growing in the fields. Authentic tequilas have a Norma Oficial Mexicana (NOM) number on the bottle, which identifies the distillery and signifies that the tequila is legal. If you come across a bottle that doesn’t have a NOM – though this is unlikely in the United States and other countries that regulate appellations of origin – don’t drink it. There are two distinctive styles of tequila. The first, and best, is labeled 100 percent agave. Not only is this style made completely from the agave plant with no discernible sugars or additives, but it can only be bottled at its origin. That means your tequila was not distilled in Mexico and then placed in a tanker truck to Texas for bottling. On the other hand, in mixto tequilas, only 51 percent of the bottle’s contents are required to come from agave. The remaining 49 percent can contain just about anything as long as it’s not dangerous. Furthermore, mixtos can be trucked outside the origin for bottling. All bottled flavored tequilas are mixto, so you’re better off flavoring your own tequila with infusions (jalepeno tequila, anyone?). If the bottle doesn’t say the contents are 100 percent agave, then it is a mixto by default. Tequila that is unaged or aged less than two months in stainless steel or neutral oak barrels. This is the purest expression of the agave flavors. A mixture of blanco tequila and reposado tequila of various proportions. Aged anywhere from two months to a year in oak barrels of any size. Some distilleries use former whiskey, scotch, or wine barrels to impart a twist on the flavors. Aged from one year to three years in small oak barrels. Aged at least three years in oak barrels. While it may be tempting to pay more money for older juice, that doesn’t mean you’ll necessarily get a better product. Aging tequilas is a relatively new concept that goes against the spirit’s tradition. Blanco tequila can be highly malleable and versatile in cocktails due to its ability to accentuate fruit and sour flavors. Some distillers market their tequila as best when served chilled, which is always a red flag. Freezing booze dulls the aromas and flavors. If a producer doesn’t want to showcase those, it’s probably low quality. When dining at a Mexican restaurant, you want to be specific when ordering tequila. Otherwise, you’ll likely receive a rail mixto in your margarita (“rail” means the cheapest or house tequila). Instead, specify that you want 100 percent agave and the style you are looking for. If you know the brand you like, ask for it. If it is not available, ask for the bartender’s recommendations for tequilas with similar characteristics. It’s important to taste every tequila on its own before attempting to build a drink with it. This will enable you to identify its flavors and figure out the most enjoyable way to drink it. Is the tequila citric, peppery, crisp, clean, balanced, fruity, or herbal? Is it wimpy, strong, mellow, or robust? Does the tequila seemed balanced? Is the finish oily, heavy, or thin? Just because one tequila tastes great in a margarita that doesn’t mean another one will. Another great way to try a neat tequlia is by ordering a sangrita. Served traditionally in Mexico, the sangrita is a tomato and tequila cocktail served with an additiona shot of tequlia. Like many classic cocktails, no one actually knows the true origin of the margarita. One story claims a bartender named Danny Herrera created a version of the margarita (tequila over shaved ice with lemon and triple sec) in 1938 for actress Marjorie King in Rosarita Beach, Mexico. Another claims that Dallas socialite Margarita Sames hosted a pool party in 1948 at her Acapulco vacation home, where she made an eponymous cocktail of tequila, Cointreau, and lime juice. But could that be true? Maybe not – according to Anthony Dias Blue’s book The Complete Book of Spirits, Jose Cuervo began using the tagline “Margarita: It’s more than a girl’s name” in 1945. Al Lucero, author of The Great Margarita Book and owner of Maria’s New Mexican Kitchen in Santa Fe, which carries over 170 tequilas and serves over 200 types of margaritas, believes the margarita was created when businessmen began bringing their wives and girlfriends to the resort destination of Palm Springs, California. The ladies did not appreciate rudimentary shooters with a side of lime, so a bartender decided to mix the ingredients and Cointreau together. When you want to make the best margarita, use high-quality tequila and always use fresh juices. Shake all the ingredients with ice to get the proper dilution of water. Experiment with different liqueur and tequila combinations to see how Grand Marnier, Mandarine Napoleon, and Cointreau play differently with various types of tequila. Lastly, try using lemon instead of lime since it maintains a more consistent flavor year round. No matter how you decide to use your newfound favorite tequila, be adventurous! After all, that’s what our friends in Mexico wanted in the first place.